I had come across Pi-hole a while ago and was recently inspired by someone on Twitter to test it out. Unfortunately I didn’t have a Raspberry Pi on hand, having just used my Pi in a Christmas present. My solution was to spin up a virtual machine (VM) on my desktop and test it out. Since VirtualBox can’t emulate ARM processors we can’t actually use Raspbian, so I used Ubuntu. The test went well and I soon had a virtualized Pi-hole blocking ads on my network (including on my phone)! When I was done for the night I shutdown the virtual machine and was sad to see ads again, particularly on my phone. I came close to ordering another Raspberry Pi, however decided to go ahead with a more permanent solution involving some sort of containerization or virtualization on my home server. The server isn’t much, just an Intel Pentium G3220 Haswell with 4 GB of RAM. The limited resources made me initially think docker would be ideal, rather than leaving a VM running on the dual-core machine all the time. I don’t know much about docker, but since it was still holiday break I thought it would be good to finally learn something about it. I ran through the get started tutorial in the docker documentation, which was actually really neat, I recommend you check it out if you’re at all interested. However, I ended up realizing that having a web server already running on this machine, and Pi-hole requiring use of port 80, complicates things beyond what I wanted to deal with. I had attended a talk about Vagrant last year, and thought I might make use of that experience. For those who aren’t familiar with Vagrant, it is a program which allows you to build and manage VMs, with the ability to interface with many different services, though for this we’ll be using VirtualBox. If you’re on a different system I’ll leave the installation to you. Vagrant has a very fast and easy to follow Getting Started Guide. The pages are short and they go by quick. If you want to get familiar with vagrant quickly, I’d recommend going through that. We’ll do enough to get the VM up and running, but won’t cover everything in their guide. This tells vagrant that we want to use the “ubuntu/xenial64” box from their publicly hosted catalog of boxes. Anyone can upload these boxes, so the usual caveats about being careful with what you trust come along with it. That said, it appears the ubuntu account looks to be official. You should be at a prompt within the VM now. Neat, right? We’ll make just a few changes to that basic VagrantFile. These are modelines, telling emacs and vi that we’re looking at ruby, which is what the VagrantFiles are in. These aren’t required, but they’re common to see. Line 4, the Vagrant.configure("2") line, tells Vagrant which configuration version we’re using. Don’t change this. We already know config.vm.box specifies the box we want to pull. config.vm.hostname sets the hostname we’ll use on the VM to “pihole”. config.vm.provider sets the provider to be “virtualbox”, which is is by default, but this allows us to specify some more options (which we’ll run through in a minute. Finally, config.vm.network specifies the network to be a “public_network”, which for VirtualBox makes it a “Bridged Adapter”, this allows us to assign the VM an IP as if it is directly connected to our local network. We then set this IP on the rest of the line to be 192.168.1.100. Set this to whatever you want, ideally outside of your router’s DHCP address range. Let’s look now at the options set in config.vm.provider, lines 7-13. This does the resource limiting for the VM, limiting the box to use of 1 CPU, and 1024 MB of RAM. (Note with this few resources, it could take a little while to boot, be patient. Vagrant defaults to a 5 minute timeout, if it doesn’t boot by then it’ll throw a warning. If you can, you can try increasing the resources available, or increase the default timeout with config.vm.boot_timeout provided in seconds.) The usb options explicitly disable USB passthrough. I do this simply to ensure any USB device I plug into the server doesn’t show up on the VM too. Then to provision the box we just need to run vagrant up. If this is your first time running vagrant up it’ll also spend time downloading the box image. Note the Connection reset and Remote connection disconnect warnings are just us trying to ssh before the ssh service has come online. You can now connect to the VM with vagrant ssh. Now we just need to install Pi-hole. For this I refer to their github page. They provide a simple one-liner which pipes to bash, not ideal. During my first installation I followed “Alternative Method 2” and checked out the script I was running. If you’re trusting enough, use the one-liner. We have to check one thing before moving forward though, our static IP interface, to do so run ifconfig, and note which interface is associated with your assigned static IP (in this example 192.168.1.100), for instance enp0s8. Once you have noted that, run installer. I won’t cover most of the dialogues, they’re pretty straight forward. You’ll want to select the interface we noted above at the “Chose An Interface” option. (If you forgot to note which interface, I can almost guarantee it’ll be the second option, since vagrant sets up two network interfaces, the first for its own use, the other for the public network. Pi-hole needs to know where to point its upstream DNS queries, since it acts as a middle man. Use whatever you feel like here, Google is a safe bet. I decided to try out Quad9. This is also configurable from the Pihole interface so don’t spend too much time thinking here. The last two prompts are about the admin interface, which is neat, you should install it. You have several options for configuring your devices to use your new VM as a DNS provider. They are well enumerated on the Pi-hole discourse. I would prefer to go with option 1, configuring the Pi-hole as my router’s only DNS provider, however I don’t want this experiment to negatively affect my housemates, so I went with option 3, configuring each device individually. This allows me to use the Pi-hole and doesn’t force it upon my housemates. I have several devices with different configurations, so I’ll go over configuring each of them. To start, my phone, perhaps the primary motivation for setting this up, since Google has been forcing links to open in Chrome, which lacks ad block on mobile. I use an Android phone, which at the time of this write up is running version 8.0.0. Click on “Modify network”. 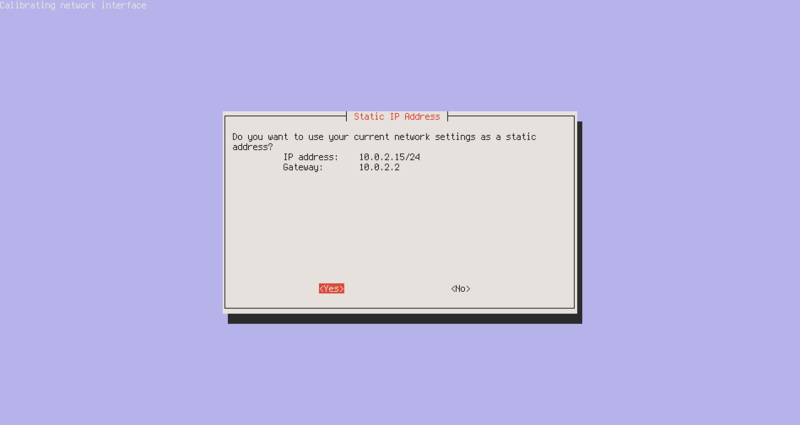 Scroll down to “IP settings”, where we want to select “Static”. Unless you’ve configured this previously it is likely on “DHCP”. I find I then have to toggle Wi-Fi off and on again in order to fully reconnect, else it might look like you’re connected, but you won’t actually have Internet access. I am running Arch Linux on my desktop and laptop. On the desktop I am using dhcpcd and on the laptop NetworkManager (with nm-applet). Their configuration differs slightly. Be sure to use an available IP address, and again one outside of your router’s DHCP range. That’s it! We’ve created a Pi-hole instance on a virtualized Ubuntu box using vagrant and configured our devices to use it as a DNS provider. You can use the Pi-hole dashboard to view how many blocked DNS requests you make on which devices. If you ever want to undo all this though, perhaps so you can move to a Raspberry Pi, you will have to revert the individual devices’ network configurations. You can then bring down the VM by navigating to the same directory where your VagrantFile lives and run vagrant destroy. It’ll prompt you to make sure you want to actually do it, but then the VM will be gone. New site layout made with Jekyll. We’re expecting some minor turbulance, please fasten your seat belts.